It was always our intention to stay at Grindley Brook for 48hrs, because we wanted to spend some time tidying the boat, and we are in no particular hurry. 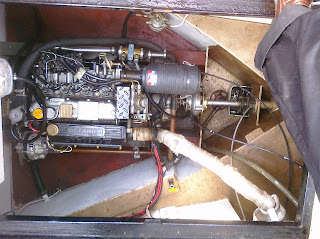 As we would be having another overnight stay without travelling I decided to run the engine for a couple of hours after 10am when everybody else had left the moorings. About half an our in, I heard a 'flapping' noise coming from the engine bay, which speeded and slowed with the speed of the engine. A quick look under the hatch revealed a portion of the alternator belt had parted company. Stopping the engine revealed that it was starting to disintegrate. It was only in March I had the domestic alternator replaced, and the belt was checked as fine then. I then had the engine serviced in June, and again it checked out OK. So, why would it choose now to self-destruct? Age appears to be the reason, I should have changed it at service time! Another call to River and Canal Rescue had everything working as it should within an hour of my initial call, thanks to Paul and Dave at Maestermyn Marine who were called out by RCR. (Reminder to myself to keep a spare belt in future!) Dave checked everything out as OK, fitted the new belt and it's up and running again. (The electrics after last year's fiasco, are now once again working fine, with two overnight stays not a problem). 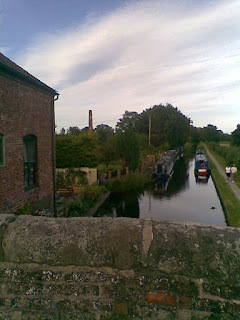 Next, it was just as well we were staying again overnight, as the canal has been closed all morning, and remains closed as I write, because someone has sunk their boat in Quoisley Lock, which has poor access should lifting equipment be required. 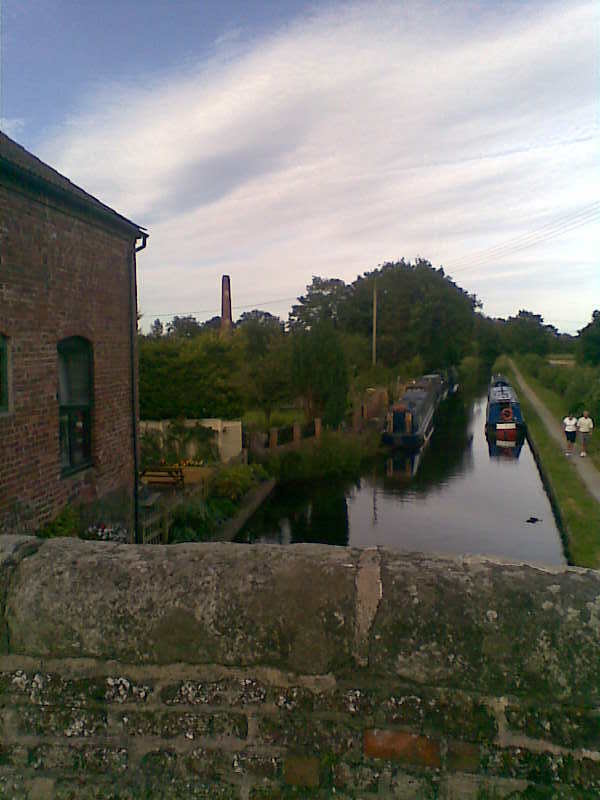 Latest estimate from the Grindley Brook lock keeper is canal to re-open at 4pm-5pm, but that could make tomorrow busy. Hopefully all will be once again right for our departure tomorrow morning, (Tuesday). We came back up the Monty on Saturday morning, once again passing Ali and John on nb-triskaideka in the Frankton top pound on their way down. After a short trip, once again in sunshine, we had another overnighter at Ellesmere before a leisurely trip back towards Wrenbury where we hope to pick up friends for a day's cruise after a lunch in The Cotton Arms on Thursday. We are now moored up above Grindley Brook top lock, and may now spend our 48hrs entitlement there, before watering up and setting off again on Tuesday morning. On today's cruise we witnessed an aerial battle going on above us between two rooks and a sole wood pigeon. The pigeon was loosing as it swooped low over the boat, when Margaret shouted out 'it's landed in the canal'. Sure enough it had in its frantic attempts to get clear of the rooks. I was ordered to pull over, when Mags leapt off the boat, ran towards the stricken pigeon, and in one swoop of cupped hands, it was gratefully out of the water and being brought back to KL, sodden, but safe and happy in Mags' arms. The bird was quite happy to sit quietly there until we reached Whitchurch lift bridge, where it was released, and flapped it's wings a little before flying off. 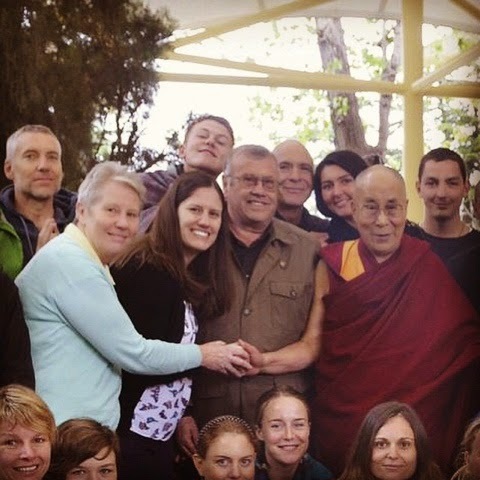 That's one pigeon that owes its life to us and is the positive aspect of this post! On the subject of lift bridges and on to the negative aspect. At this time of year the canals are full of inexperienced narrowboaters, and one has to make allowances for this, no more so than us here on the Llangollen, said to be one of the busiest. However, one aspect of this inexperience has left us both wondering what happened to common sense. 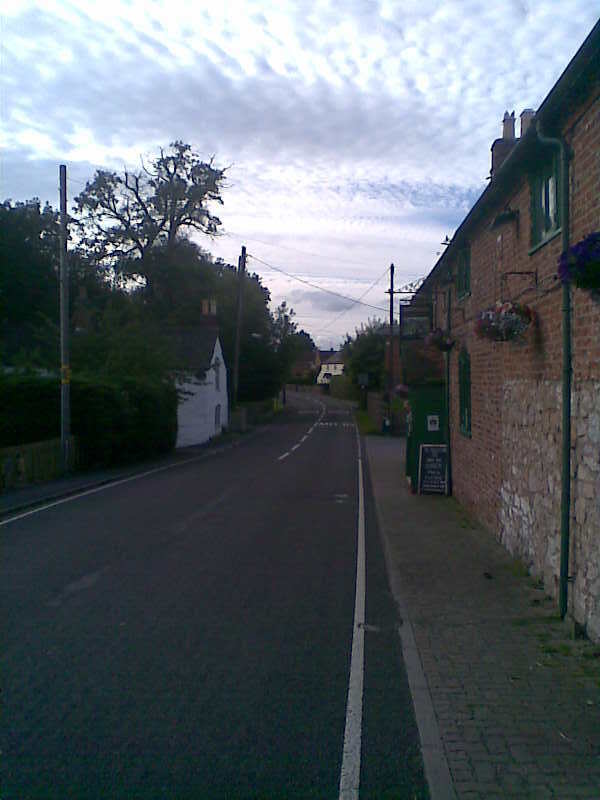 There are a number of lift bridges in close proximity through Whitchurch towards Ellesmere. As the canal is busy, we tended to arrive at these bridges with other boats, and without fail, the crew of the preceding boat not only left the bridge open for us to pass, but also boarded their boat as it went through the bridge hole, creating a small but unnecessary danger for both crews, when we then had to drop off under the open bridge in order to close it as we passed. Personally, I would have waited by the bridge and waived others past, before closing it myself and re-joining KL after she too had passed. I believe that to be the etiquette, but it makes more sense to me in any case, although I know single handers have to operate bridges in the first way, and we would be the first to offer them the opportunity to rejoin their boat for us to continue the procedure. We even arrived at the road lift bridge that takes traffic to the scrapyard near to the Prees Branch, to find the bridge open with no other boats in sight. There was however an angry motorist waiting on the 'wrong side' of the open bridge not able to go anywhere. We obliged with closure, and apologised on behalf of whoever it was that left it open and then left. Other incidents witnessed have been a near head on collision as one boat approached a 'blind' bridge too fast, and couldn't stop when they saw a boat approaching in the opposite direction. At least half a dozen lock paddles left open, no boats in sight, and I have lost count of the number of times we have been thrown about by boats passing us too fast whilst we have been moored. Those reading this who might find some of the above familiar, please click on the 'Considerate Boater' link at the top right of the home page! We arrived at Ellsmere on Thursday afternoon when I rang CaRT to book passage through Frankton Locks today. After a leisurely cruise this morning, we arrived in time for me to do a little painting before the lock keeper arrived at 12pm. Passage onto the Monty is between 12pm and 2pm daily, and must be booked before 10am for a same day passage. The 7 mile journey to the end of navigation showed us some amazing scenery and is well worth doing, so quiet and peaceful compared to the Llangollen. We had evening dinner at the Navigation Inn at Maesbury Marsh. 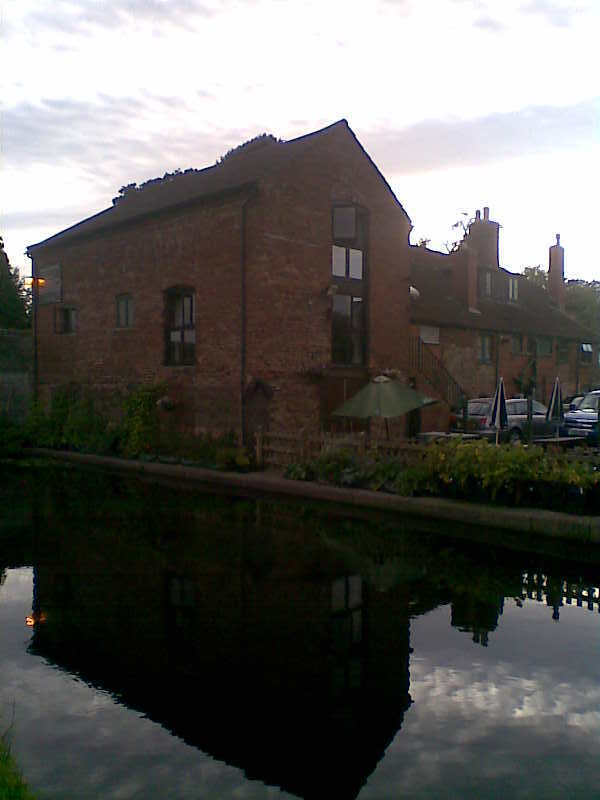 This is canal side, with a dining room located within a restored 18th. Century canal warehouse. The atmosphere was stunning, and the food, available from several menu options was excellent. We are moored directly opposite, perhaps as well after 2 pints of their Bumble Bee guest beer! All is well in our world tonight. Apologies about the image quality, they were done on my phone and the light was failing. For a better look at what we experienced here this evening take a look at The Navigation Inn. We are now back at the boat after a short walk over the bridge on to the tow path, and we are now watching the Olympic opening ceremony, good TV signal, good 3 mobile internet signal, but if this post appears twice, it is because the email version I sent from my mobile phone appeared to get lost in cyber space! We decided to take the boat out for the first time this "Summer" on Tuesday. An open ended cruise lay in front of us, and we decided to "bite the bullet" and take her down the Llangollen in high season. We left our departure until after lunch yesterday, and spent the evening in Wrenbury with a few "essentials" bought in the Cotton Arms After a walk in the sunshine again today to buy a morning paper, we set off again at around 10.30am, having met Ali and John from nb Triskaideka yesterday afternoon while we were sat on the bench at Wrenbury Mill eating ice cream! Today, Wednesday, we moored for an excellent lunch and a pint at Willey Moor Lock Inn, before we hit the usual bedlam at Grindley Brook Locks, which took us 3 hours to get through, the lock keeper letting 6 at a time each way. We eventually moored up on the 48 hour moorings above the top lock at around 5.30p.m, but who cares about time, Margaret enjoys the social life at the locks. We are now moored next boat but one to Triskaidaka, and at some stage tomorrow, will head towards Ellesmere, and the Montgomery Canal. "prosecutors must consider ‘the cost to the prosecution service and the wider criminal justice system, especially where it could be regarded as excessive when weighed against any likely penalty." Image courtesy of Free digital photos. The CPS already operate on a balance of probability of success before bringing charges, and the decision to charge an offender has been removed from the Police for years. 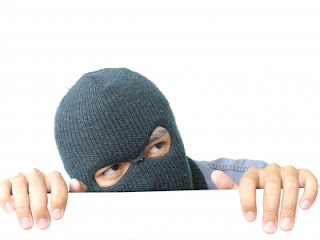 I spent much of my time during the 80's and 90's bringing offenders to justice, but decided to opt out of the system when the paperwork and red tape I had to encounter on a daily basis started to take longer to process than it took the offender to re-offend! I dread to think where this might now take us, but surely can't be right. We have just returned from one of our regular trips to Central London to visit our daughter. This time, we decided to forget the hassle of taking the car, and booked advance train tickets with Virgin Trains. We used the service from Wigan North Western Station to Euston and back, with reserved seats, a journey time of just under two hours. It cost me (not yet a senior), £3.80 for a single bus ticket on First Buses for the 5 mile trip from home to the main line station in Wigan. The pre-booked single fare from Wigan to Euston was £12. The tube fare across London from Euston to SW17 (Zone 1 and 3), was then just £2.60. I have been persuaded to leave the car at home by the very reasonable and efficient rail journey to London, but how can £3.80 then be justified for the bus trip to Wigan? If the powers that be would like us to stop using our cars around provincial towns, they will have to do better than that. (Transport for London fares on buses around the capital are all around £1.40 per journey using a pre-loaded Oyster card, as I was charged for the journey from Kings Road Chelsea to SW17, again very reasonable). See Transport for London. 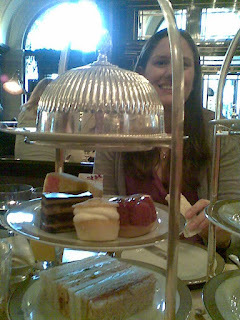 The highlight of this trip was Sunday afternoon tea at The Wolseley, next to the Ritz on Piccadilly. Fresh warm scones are under the silver cover. Fresh cut sandwiches, (crusts removed of course), with various fillings are on the bottom plate, and we ordered Wolseley afternoon blend tea, which was served in a silver tea pot. Strawberry jam and cream was included in small silver containers. All very civilized. The restaurant is situated in what was designed and built as a prestigious car show room for Wolseley Cars in 1921. Unfortunately, sales didn't materialise as expected, and by 1926 the company was no more. 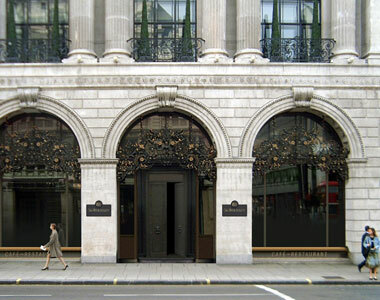 Barclays bank took over the building in 1927. The original interior design drew on Venetian and Florentine influences, and the cars were displayed on marble floors. The interior has now been spectacularly restored, keeping much of the original décor, and the venue attracts the movers and shakers of the world. It has been used in this way since 2003. If you happen to be visiting London, and fancy a treat, the afternoon tea comes in at £22.50pp, but we didn't need a further meal that day. The restaurant also has a full food menu if you prefer. 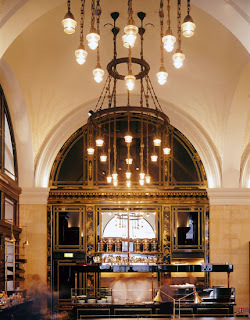 Read about it here: The Wolseley.